‘Tis the season for fall enrollment deadlines for U.S. colleges and universities. This is the time of year when many accepted students must choose which U.S. college or university to commit to for the fall. For international students, they are deciding whether to come to a school in the United States or study in a country with more welcoming policies and rhetoric. More and more data are rolling out that show how the negative rhetoric and policies from the White House are putting the United States at risk of losing its status as a premier destination for international students and scholars. The trend over the past decade has been that while the number of international students studying in the United States continues to grow, the U.S. market share of international students has declined. But now, the overall numbers of students are starting to decline as well. As Politico and other news sources have recently reported, new international student enrollment in the United States declined by 3 percent in the 2016-17 academic year, and that decline is expected to double in the upcoming academic year. Meanwhile, countries including Canada, China, Australia, Japan, Spain, and New Zealand are seeing double-digit increases in international enrollment—no doubt due to their welcoming policies. Countering the harsh narrative and the policies from the Trump Administration can help prospective students and scholars feel welcomed and wanted as international visitors and can make the United States a more desirable option again. 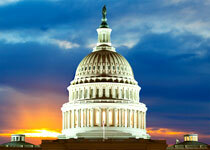 During NAFSA’s Advocacy Day in March, international educators met with their members of Congress, asking them to speak out for international students and show their support for a more welcoming and globally engaged United States. Some of those advocates kept the conversation going with their senators and representatives, making repeated requests and sharing stories demonstrating the importance of international students and scholars to their campuses and their communities. This resulted in a series of tweets and floor statements from both sides of the aisle that can help reassure our students, scholars, and colleagues that the United States still values them. 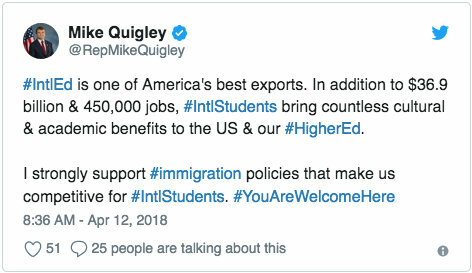 As these tweets and statements note, international students and scholars contributed $36.9 billion to the U.S. economy in the 2016-2017 academic year, supporting 450,331 jobs across the county despite making up only 5.3 percent of overall enrollment in U.S. higher education. These students bring countless academic and cultural benefits to U.S. communities as well, and efforts to discourage international visitors from coming to the United States will only hinder U.S. growth, innovation, and security. 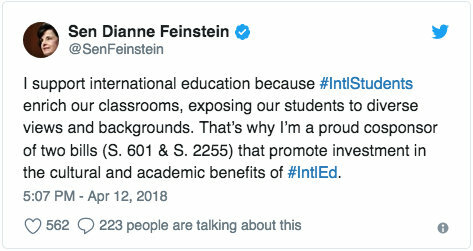 We invite all members of Congress to share their support for international students and scholars and to support immigration policies that will allow the United States to once again be a welcoming option for international students. International educators can use this advocacy toolkit on Connecting Our World to request floor statements from their senators and representatives. By working together and continuing our advocacy, we can create a more welcoming, globally engaged and informed United States.